There are six new polls today, including Florida and Michigan. Rasmussen confirms Gallup's result that Bush is a fraction ahead there, 49% to 47%, with Nader at 2%. Kerry maintains his small lead in Michigan 48% to 45%. The other polls don't change anything either. A number of Senate races have been updated today. The most interesting result is in that always politically-fascinating state, Florida. With the senatorial primary coming up next Tuesday, it now looks like Betty Castor (D) vs. Bill McCollum (R), although the Republican race is still tight. 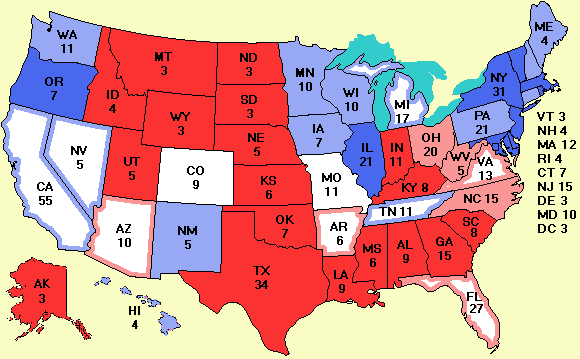 Quite a few people have looked at yesterday's map and observed that it is easy to devise a scenario in which the electoral college is tied. They have asked me what happens then? Since this question is asked a lot, I have added it to the FAQ. If you haven't seen the Jib Jab movie yet, by all means look at it. It is very funny and pokes fun at both Bush and Kerry. Now some news about the site. Time for a contest. I am looking for a favicon.ico, the little icon next to a name on the IE Favorites list. With 80,000 to 90,000 visitors a day now, there are bound to be a few graphic designers among them. If you want to enter an icon into the Great Electoral Vote Predictor Icon Contest, send it to me in the standard Windows .ico format before midnight, Friday Sep. 3. The prize is a listing in the acknowledgments section of the Welcome page. Thousands of people will see this and it will probably bring quite a bit of traffic to your site. Finally, we have an improvement to the site. By popular demand, 'Grumpy' has added a linear regression line to the state polls. Here are some important facts to know about the lines. As an example of the pitfalls in this kind of modeling, consider Missouri Currently it is tied. But in mid June, Kerry was way down. The computer (correctly) sees that Kerry has made huge progress in the past 2 months in Missouri and thus extrapolates he will continue to make huge progress there in the next 2 months. If you know that Kerry was polling 37% two months ago and is at 47% now, based only on this data, it is correct to predict that he will be at 57% in two more months. There is nothing wrong with the software. This kind of prediction is inherent when the data are sporadic, noisy, and rapidly changing. Of course one could make more sophisticated mathematical models, but there are an infinite number of possible models and one could have endless arguments about which is best. As we approach election day, the kind of effect will become much smaller. For the moment, don't take the extrapolations too seriously. The volume of mail has increased to the point where I simply cannot answer it all any more. It was taking 4-5 hours a day. I will still read it all, though. Short, clear questions that are germane to the election have the best chance of getting an answer. E-mails starting "Dear Babykiller" have the least chance of getting an answer. Be sure to read the Welcome page and the FAQ. A lot of common questions are answered there. I do apologize for having to be so impolite.